There are four hamlets in Ellenburg. 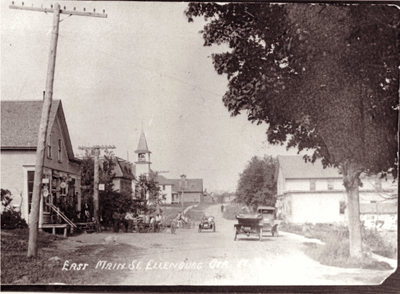 The first hamlet formed was Ellenburg Corners, being a place where an old Indian path crossed the Chazy River. The second hamlet was Ellenburg Center, located in the northern center of the town. This hamlet became the seat of the town government. About 1853, the first Town Hall was built there. 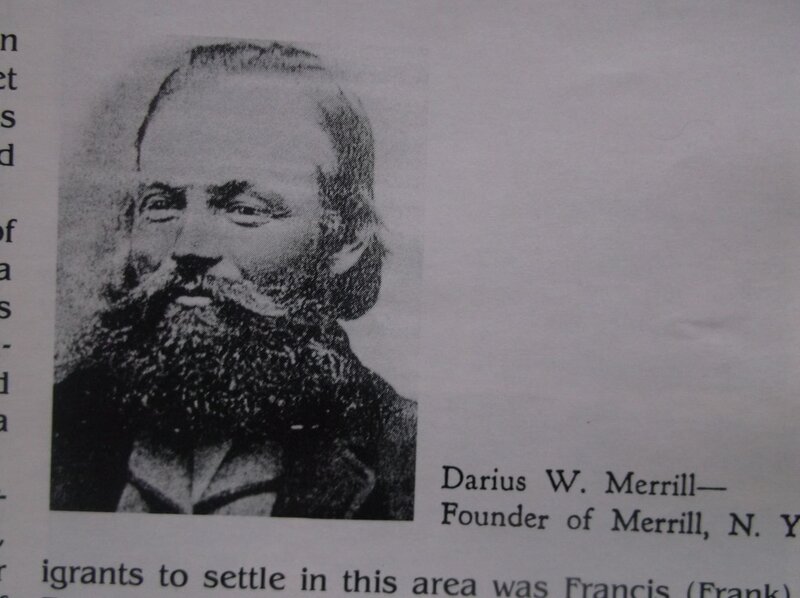 The third hamlet formed was originally called “The Forge,” but was later named Merrill. This settlement is at the southwest corner of the town. This hamlet was named for the pioneer family of the Merrill’s. 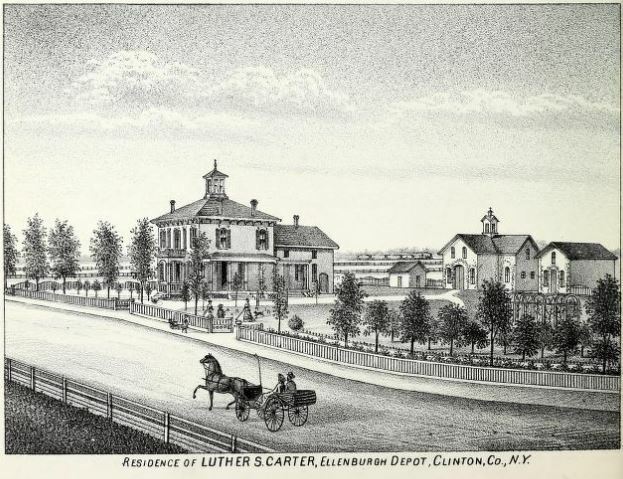 The fourth hamlet is Ellenburg Depot. 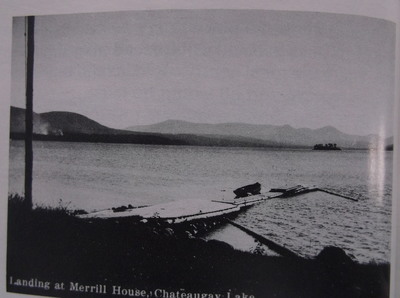 In 1787, Lieutenant Phiny Moore and his men came up the Chazy River to what is now Ellenburg Depot and began to construct a dam. It wasn’t until about 50 years later that other people began to settle the area. In 1786, an area in Northern New York was laid out and designated as the Old Military Tract. It was composed of 12 Military townships. The north end of Township 5 and south end of Township 6 formed what was to become the Town of Ellenburg. The first white person to set foot within the present limits of Ellenburg was James Hatchet in 1796, but left soon after. It is presumed that he was driven off by wild animals. Alber Pomeroy of Vermont was the first permanent settler in 1803. The early settlers faced many difficulties; there were wild animals that prowled the countryside. Wolves were the main issue. They were hunted by people armed with guns, pitch forks, and clubs. They would surround an area and begin their drive. When the wolves heard them, they would begin to move and attack at different points. Many wolves were killed during these hunts; occasionally a catamount or panther was killed. 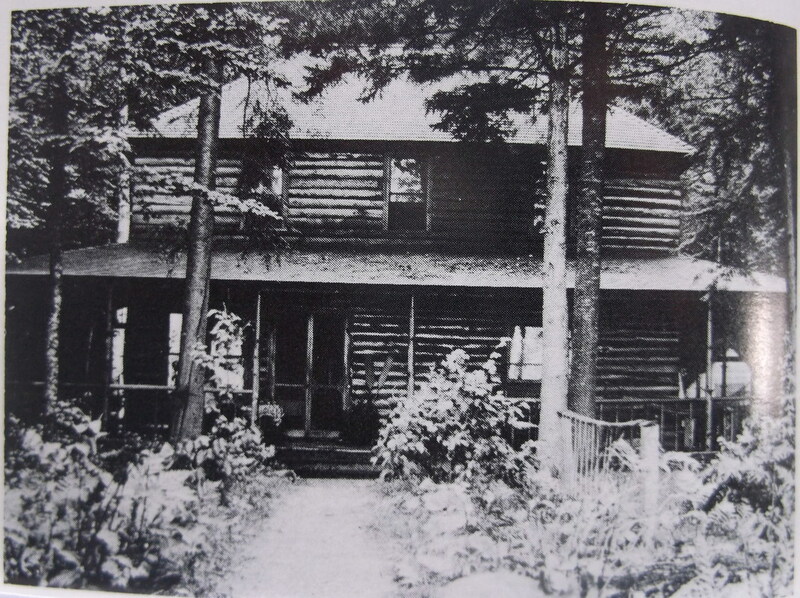 In 1820, Mrs. Harriet Murray and her brother Lloyd Rogers became the owners of Township 5. They divided it into 300 lots, one third of a mile wide. Each owner claimed 150 lots. Harriet Murray made the generous offer of giving homesteads of fifty acres to each one of the first ten settlers in the Township. The balance of Mrs. Murray’s tract was sold for three dollars an acre and everything was done to make the new settlers comfortable. Mr. Lloyd Rogers gave notice he would give a deed of fifty acre to each of the first two settlers of his lots in Township 5. Moses Craig took one of the lots, who then sold it to Jeremiah O’Brien. Mr. O’Brien eventually obtained a deed to the fifty acres, but it is reported that Mr. Rogers gave it reluctantly and only after his life was threatened. The land is located on what is now known as West Hill Road. By 1830, enough settlers had located in Township 5 and 6 to warrant the formation of a new town. It was called Ellenburg. 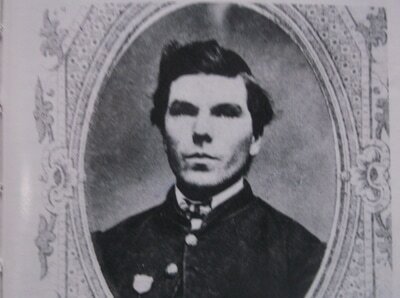 The eldest daughter of John and Harriet Murray was named Ellen. To show their gratitude for her generous gifts and fair treatment of early settlers the people in the area, called it Ellenburg, in honor of their eldest daughter. 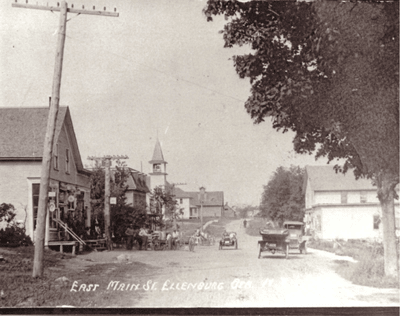 Ellenburg Corners became the seat of town government in 1830, when Ellenburg was established. 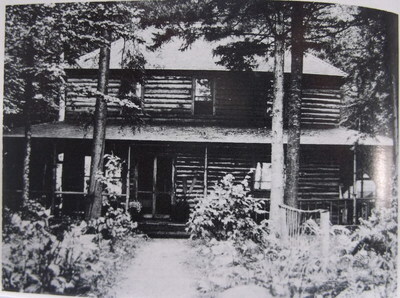 The first town meeting was at the house of Lewis Ransom on March 1, 1831, for the purpose of choosing a suitable person to fill the different offices in town. In 1830, John Murry, erected the first sawmill and grist mill. 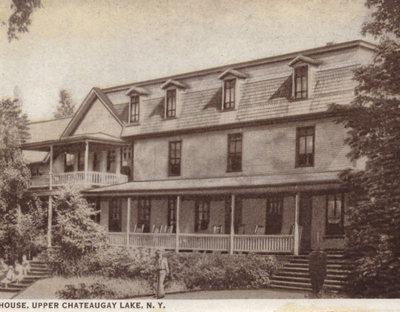 In 1851, Ar on Sawyer built and immense tannery for sole leather, alongside the Chazy River. The first works were run by water but in 1868, steam was added. It was capable of handling 18,000 hides per year. Alva S. Marshall, built the Carter and Vestas Mercantiles Store in the Corners in 1842. 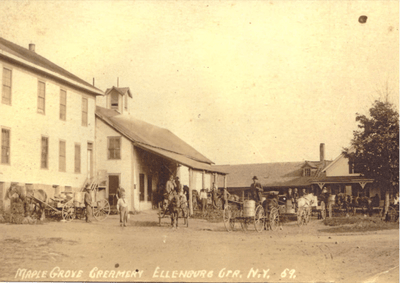 In the 1860’s the firm Carter and Vestas moved their starch factory to Ellenburg Corners. The starch was made from ground potatoes. 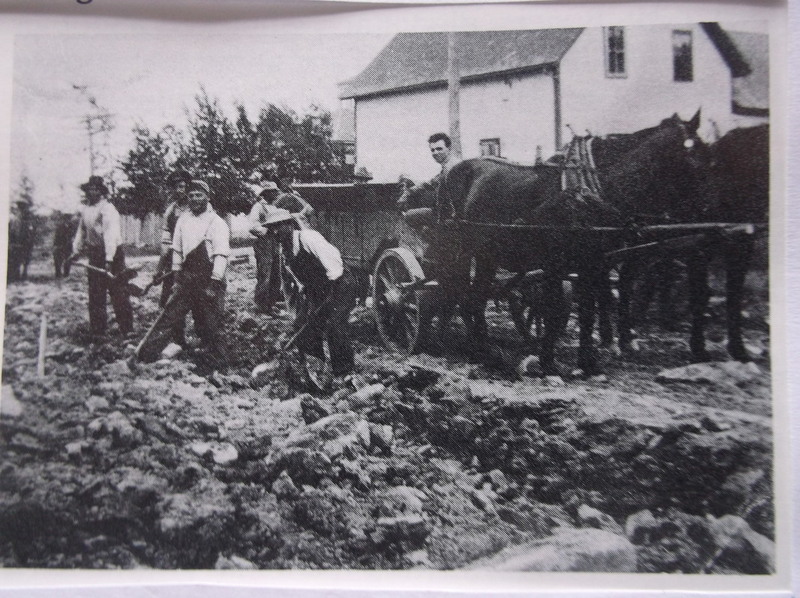 The soil being excellent for potato growing in Ellenburg, made a successful occupation for the local farmers. 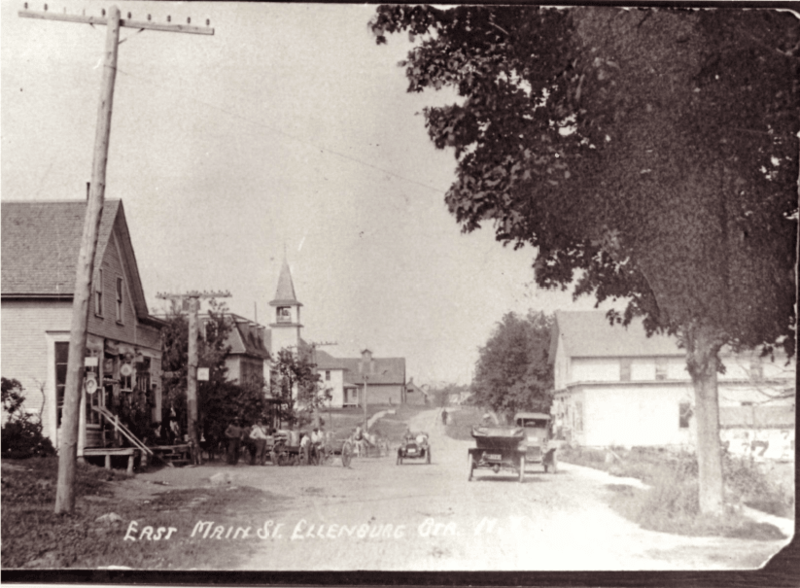 In the late 1800’s, a butter factory, at Ellenburg Corners was run by Edson Potter. 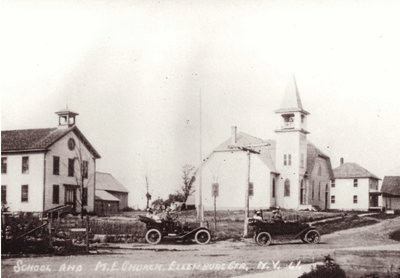 By 1880, Ellenburg Corners had four churches, three stores, a hotel, a tannery, a starch factory, and a saw mill. The population was about 200. 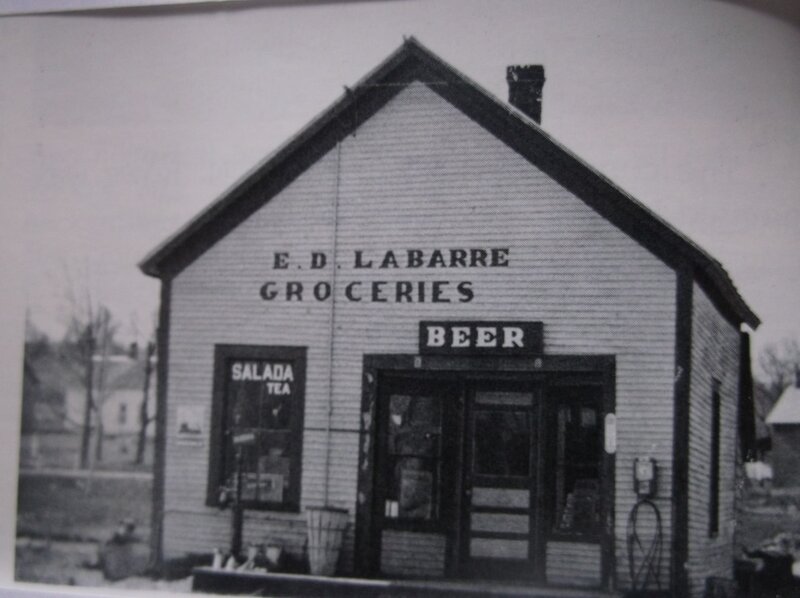 Edward LaBarre opened the Ed LaBarre Groceries and to this day it remains in the family. sawmill flooded the area behind the homes on East Main Street creating Mill Pond. 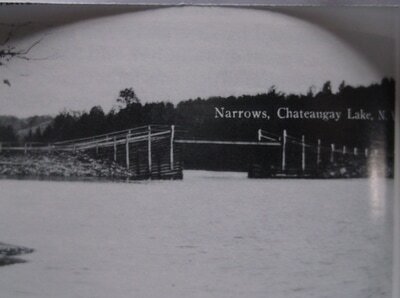 Following suit, other sawmills were built on the river by Benjamin Hobbs Sr, James Short, Henry Shutts, and Anson Baker. There were two churches. Members of the Baptist Society, formed in 1840 and held their services in school houses until 1853, when a church was built by Harriet Murry’s son and presented it to the townspeople, which all denominations were free to worship. 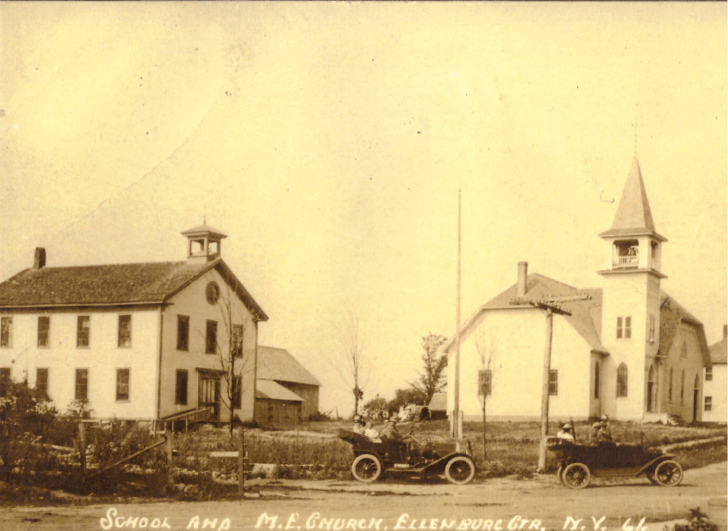 In 1844, the Methodist Society, built a church about 1.5 miles east of Ellenburg Center, which was used until 1853, when Mr. Murry built a new church in the Center. With a decline in population and business at the Corners in 1853, for the sum of $340, a site was purchased in Ellenburg Center, and a Town Hall was built and became the new seat of government. 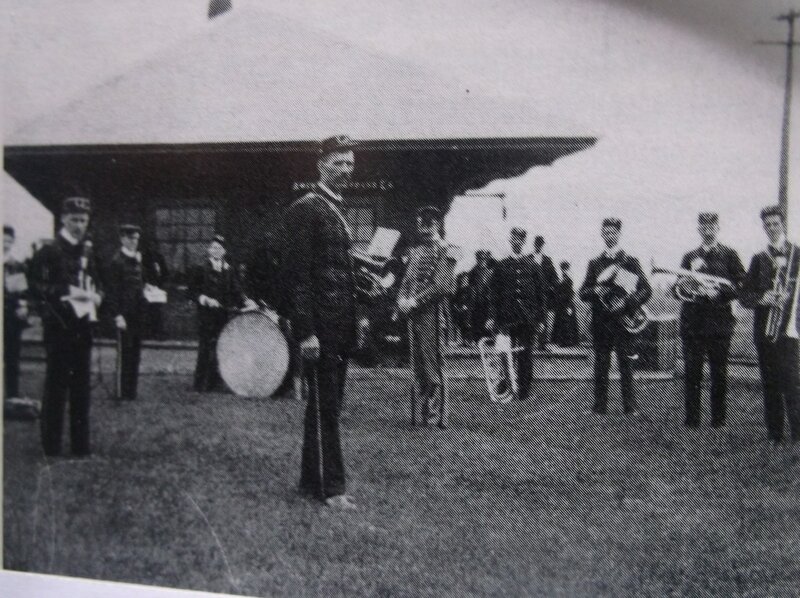 On May 21, 1924, the hall was destroyed by fire, a new building was approved and serves as the Town Hall today. In the Town Hall, on the second floor, they built a beautiful 170 seat theatre. It served as a community center for plays, music events, and all sorts of community activities. 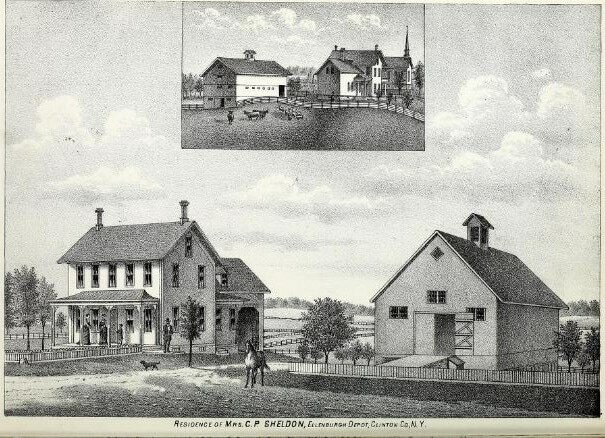 In 1853, RS Webster and CH Dow bought mill privileges from the Carpenters. Potatoes were purchased from local farmers to be used in making starch. The local potato crop averaged between 250 and 350 bushels per acre. The local starch factory predicted farmers could expect a return to 15 to 20 cents per bushel for potatoes delivered to the factory. 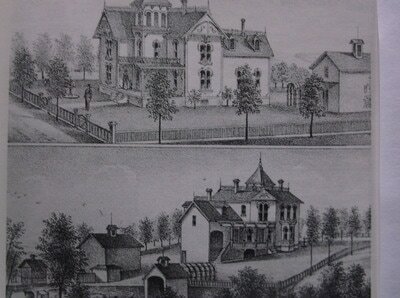 The first hotel was built in 1860 by Henry Hartford. In the late 1800’s there were several creameries in Ellenburg Center. 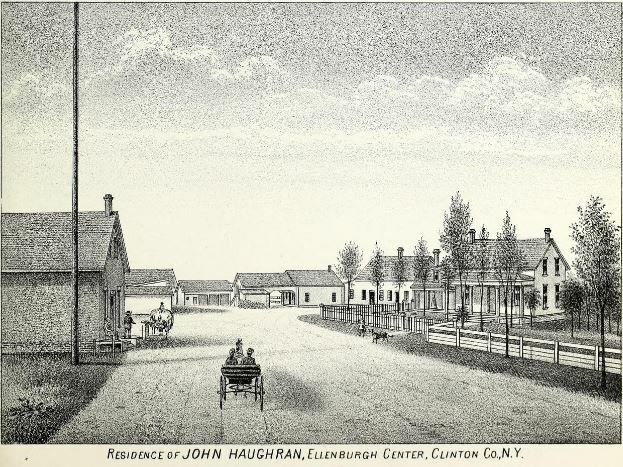 John Haughman built a creamery at Star Road in 1882. Other creameries were constructed by Mike McGavelley. The Bigelow Creamery at the corner of Spear Hill Road and Peets Road. Roy Hobbs, was buttermaker at the West Hill Creamery. 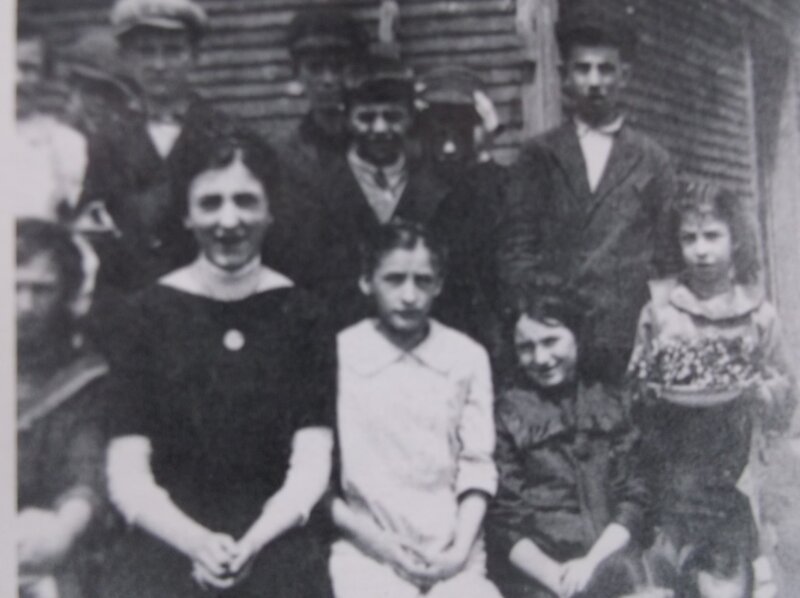 The Cold Springs Creamery was located on the Barcomb Hinds Road. The “village smitty” was essential in the early days. There were several blacksmiths in Ellenburg Center. Albert DeLong, Sevine Stafford, the Lloyd Brothers, and James Gregory. 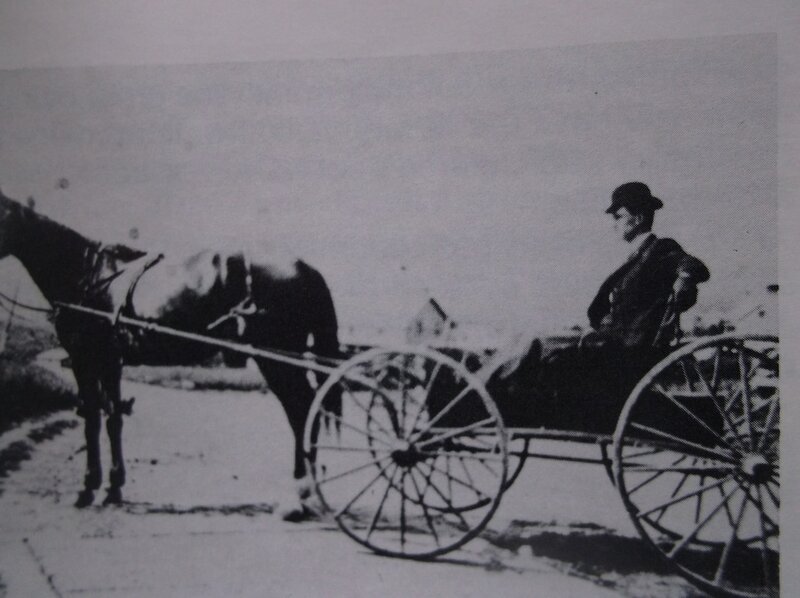 Mr. S. Webster, a native of New Hampshire, established a steam mill in South Ellenburg, near what today is Bradley Pond Road. Produced there were shingles, clapboards, lath and barrel staves as well as custom sawed lumber. trial from New York City to Malone. Mr. Schultz spent a night or two at the Merrill House. 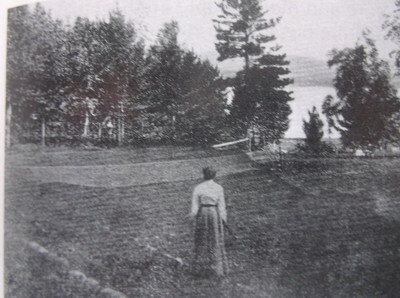 At the time the Merrill House was operated by Mrs. Watson Reilty, who bought the hotel from Watson P. Merrill in about 1892. She operated it until 1933.
only means of obtaining raw materials as well as marketing the manufactured goods and the agricultural produce of the surrounding area. Most of the potatoes raised in this northern tier were sold in Eastern Markets. Potatoes had formerly brought about twenty-five cents at the starch factories, rose to fifty cents per bushel depending on the supply and demand. 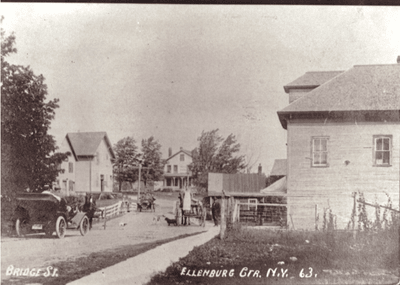 In the 1890’s about 4,000 bushels per day were being loaded into railroad cars for the market at Ellenburg Depot. 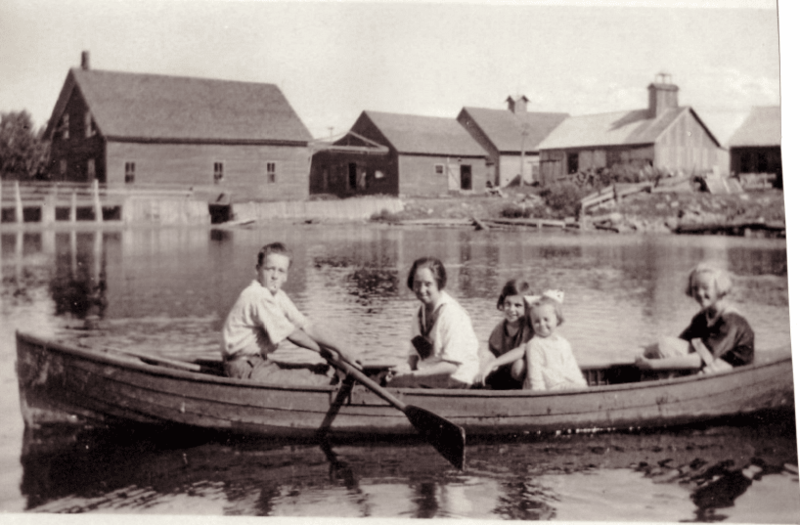 One of the early butter factories of this period was owned by George McGregor. Milk was sold for about 50 cents per hundred. 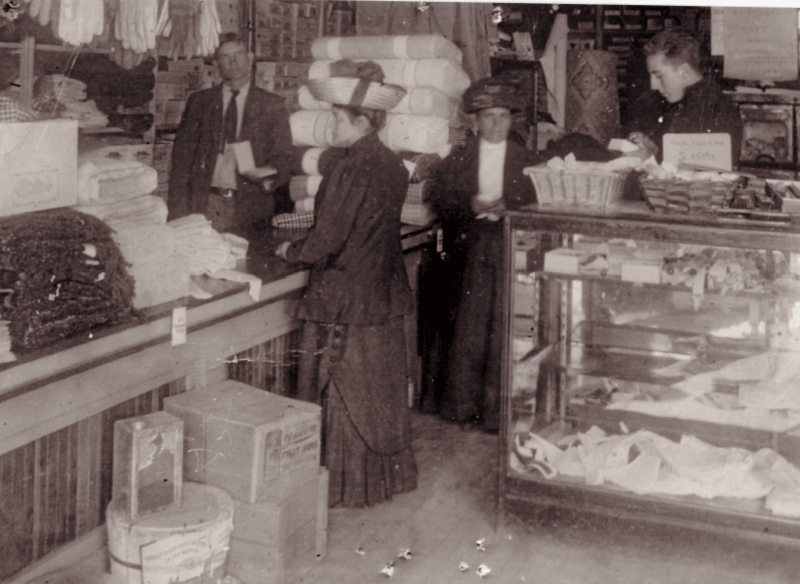 The sale of milk, hay and potatoes was the principal farm income. Lumbering was a big industry in the North Country. A great many men were employed in the woods, south of Ellenburg Depot. 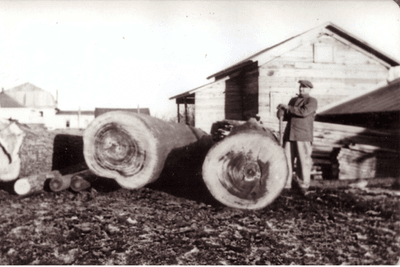 Mr. George McGregor and Mr. Robert Sherlock were the biggest lumbermen of the time. They bought out large tracts of virgin timber on the west side of the Plank Road at six dollars per acre. Each employed about 75 to 100 men to cut the wood, with about 50 teams of horses to haul the wood. Many men and their families lived in shanties along the Plank Road. Other men would live in buildings in the woods where a cook was employed. Each man was paid about a dollar a day. Large quantities of spruce were used for pulp. Hemlock, birch and maple were made into lumber. 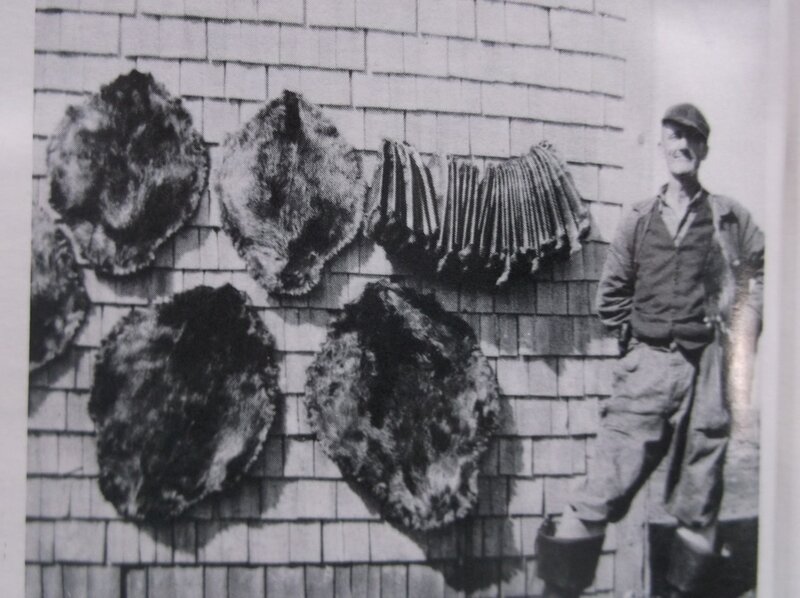 Cedar was used for shingles and the peeled bark was used for tanning. 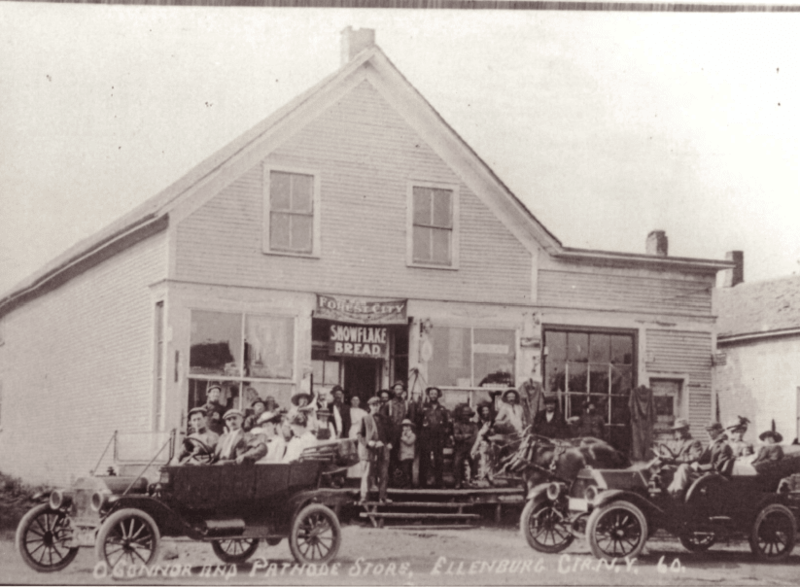 Each lumberman had his own store and merchandise in order to care for the needs of his men. 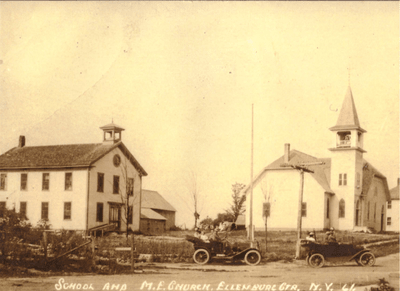 There were two churches in Ellenburg Depot, the Baptists dedicated their church in 1870. The Methodists Church was completed in 1873. The McGregor House Bed and Breakfast was built in 1906. . About 1915, George T. Chilton’s General Store opened in Ellenburg Depot. It was demolished in 1950, due to the reconstruction of Route 11. 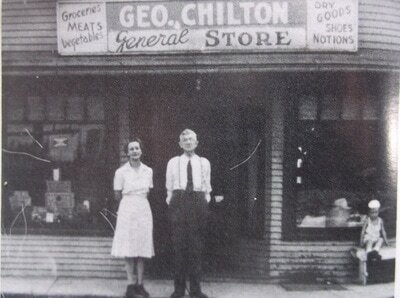 In 1920, the GLF Corporation opened a farm utility store on Depot Hill adjacent to the Railroad Station. C Myers and Sons was located on the Agway Corner. 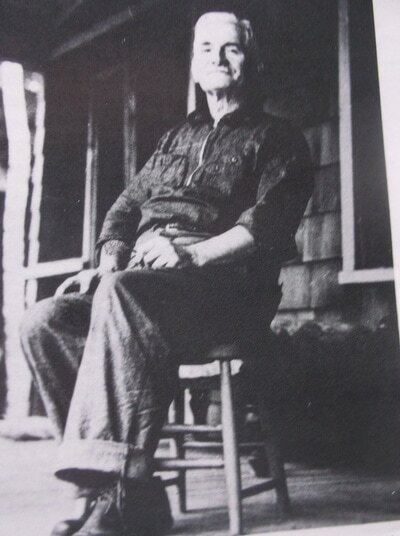 Tom Rutherford was a village Blacksmith situated north of the Canaan Road. 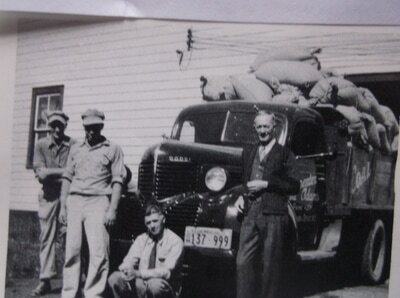 Carpenter and Adams feed business operated in the Depot int eh late 1930’s. Through the years many of the businesses, saw mills, Tannery’s, Creamery’s, Inns and Railroads closed down. Most of the farms stayed and grew producing primarily milk. Since 2006, 70 windmills have been erected producing clean, renewable energy. 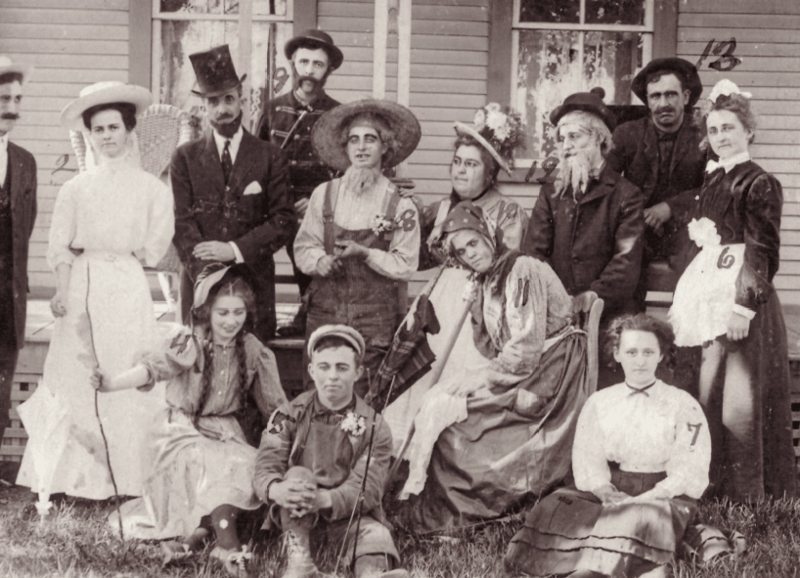 Many decendants of the original founding families remain. They carry on the legacy of a hard working, generous, inventive, fun loving group of individuals. Ellenburg covers an area of 112 square miles. It is a beautiful area of lakes, mountains, valleys, and its northern border is shared with Canada. It is a wonderful place to live. There are two main sources of history. Myra Magoon White recorded much of this information on the back of 8 ½ by 11 inch sheets of inventory and price list forms issued by the Ford Motor Company to its distributors in 1938. Her husband was a Ford Dealer in Ellenburg. Myra was born in Ellenburg Center and a former school teacher. 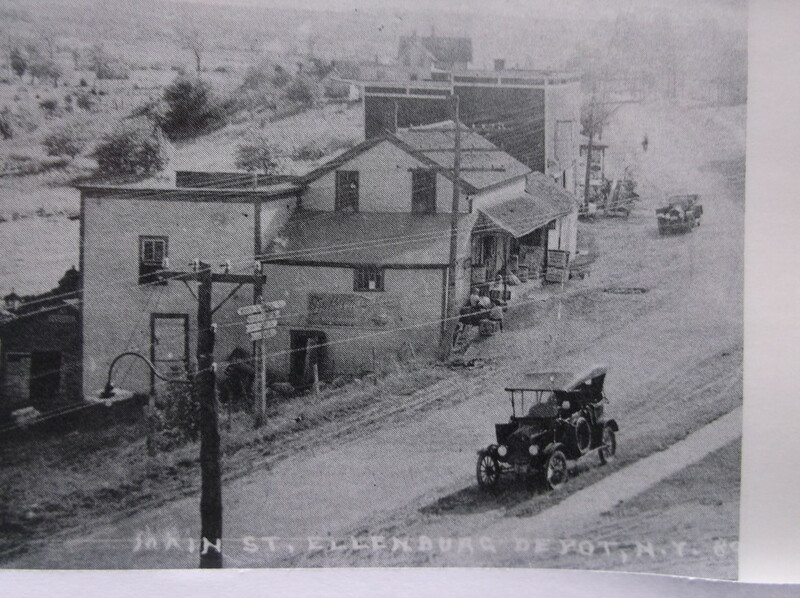 The actual author of the book, History of the Town of Ellenburg, was John W. Harold. In 1990, a beautiful hard cover book, Ellenburg Yesterday and Today, was printed. It is and extensive history of the town illustrated with many photographs. The Ellenburg Chapter of the Catholic Daughters of the Americas initiated the idea. The sponsoring committee, was spearheaded by Theresa LaValley and her co-chair Jane Fritz, and members Judy Bombard, Marguertte Forette, Thelma LaBombard, Margaret Soper and Yvonne Taylor. The principal writers were Yvonne Taylor, Iris Barcomb, Jose Triggett, Jean Drown and Reginald Merrill. 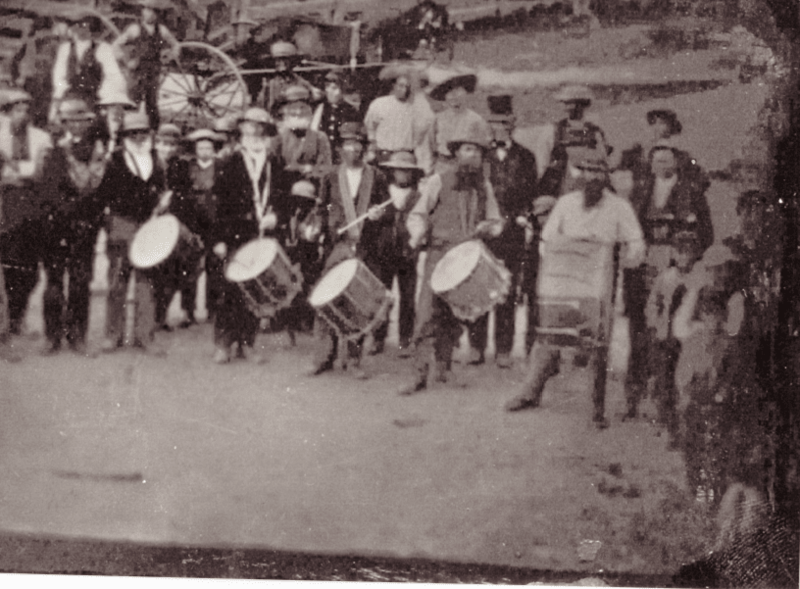 We are indebted to all of these contributors who through their interest and efforts, have kept our town history alive and made it possible to transfer this information to our website. Many thanks go to Joan Hobbs, our Town Historian, and the Hobbs family, for many of the historic pictures seen in this history section.